Just follow the step-by-step strategies and techniques outlined below and you can turn your existing blog (or a brand new one) into a real cash generating online business! If you’ve been looking for a way to start getting results in your business — one that is EASY and that doesn’t require a programming background or extensive technical skills – this letter is for you! I could sit here and go on and on for hours about WHY you want to use a WordPress blog as the heart and soul of your business and your online presence, but I don’t want this to come across as a hype filled sales page… It’s anything but that! Higher Search Engine Rankings = More Traffic: Google, Yahoo, and Bing are all in love with the way that WordPress organizes your site, making it easier for people to find the information they’re looking for. This means that you’ll get higher search engine rankings with very little effort, helping to bring you tons more traffic than you could generate with any other website! No Technical Skills Required: Using WordPress to build your online presence is about as easy as using Microsoft Word to write a paper! If you can type, you can create stunning websites with no technical knowledge at all! Best of all, WordPress is totally FREE to use and you can get started in less than a few minutes! A Blog lets you have a 2 Way Conversation instead of talking at people: In this Web 2.0 world that we live in, people are looking for strangers with experience who are willing to share that experience to help them solve their problems. That means that you need to be talking WITH people instead of AT people and that’s precisely how your new blog operates naturally! If you’ve been online for long at all, though, you probably already have seen that just an ordinary WordPress blog alone doesn’t necessarily ensure that you get great results in building your business. In order to get results with your blog, you’ll need to have a SYSTEM. That system needs to ensure that it helps your reach the right people, with the right message, at the right time. And, that system needs to ensure that you don’t just drive traffic but that you instead focus on driving traffic in a way that makes you money! Otherwise you’ll be sitting there spending a lot of time with very little to show for efforts. Product / Service Sales: You can create your own products or buy the rights to specific products that relate to your niche and offer them to your visitor (this technique can make a lot of money!) A popular blog can increase traffic and sales of related products through your shopping cart! The “21 Days to Blogging Profits” guide is a no B.S., straight to the point guide that will teach you everything there is to know about making money with your own blog and help you get started ASAP. Important! Before You Continue… This Book Is About How You Can both Set Up Your Blog and do so in such a way as to Receive All The TARGETED Traffic You Need – Regardless Of How Many Sites You Have. And through this package, I’ll Show You How You Can Do Just That In 21 Days. Although there are free strategies that are covered in these materials, you are going to need some tools that are not free. And, some of the biggest traffic generating strategies require an investment as well. In all, you can expect to spend Less Than $200.00 to execute every strategy covered. So If You Think That 21 Days Is Taking Too Much Of Your Time or That $200.00 is Beyond Your Budget, You Should Leave This Page And Leave The Copy For The Next Person! Six (6) Killer Resources To Help You Get Maximum Results in Minimum Time From Your Blogging Efforts! I want to make sure that you run into no brick walls whatsoever getting your blogging started. That’s why I want you to have a complete “system” that you can easily implement to get the results you deserve. Everyone learns best in a different way, so it’s important that you get similar material in different formats. That’s why you’ll be getting audio, videos, flowcharts and checklists along with the “21 Days to Blogging Profits” Guide. How to setup a WordPress Blog and optimize it for maximum traffic producing results. How to write powerful blog posts that get your visitors to take the actions that you want such as subscribe to your list, buy your products or services, click on your affiliate links, etc. How to post on your blog without getting in trouble with the search engines. How to set up an RSS feed in Feedburner and add it to your blog. With your FeedBurner account, you’ll be able to add over 20 different features to your blog, optimize your blog, and promote your blog … all with a few simple keystrokes! How to get subscribers to your RSS feeds so that you’ll have readers even when you don’t have visitors! How to set up your sidebar and use it to improve the engagement of your visitors. Engagement fuels conversions and conversions fuels sales so improving visitor engagement means more money in your pocket! To make things even more crystal clear, you’ll get 2 Flowcharts that are like complete blueprints of the blogging process. Simply follow along on the Blog System Flowchart and theBlog Layout Flowchart that I’ve included as well. In the end, blogging success is really about the traffic. How much targeted traffic you drive to your blog directly determines what kind of results you get from your blog. How can you get even more traffic to your blog? Well, there are a number of different ways to do that. That’s why I’m including “Red Hot Traffic in 10 Days“, my newest ebook that will show you how to drive red hot TARGETED traffic to your blog in 10 days, for under $200 (including all the tools you’ll need to see results). How to drive in molten red hot TARGETED traffic into your websites in 10 days… for less than $200.00! The 6 highly effective techniques of reaching out to multiple pool of your potential buyers! How to “trap” the potential buyers who visit your websites so that they will keep coming back! How to make every word you write become an official sales agent on your behalf and delivers you the potential buyers you and your business need… in droves! Getting HIGHLY TARGETED traffic from Pay-Per-Click programs without having to gamble! Marketing amateurs, when given any amount of money, are in actual fact gamblers and not marketers. I will show you how to make every investment you make into PPC programs bear their fruit and reward you with the traffic you need, and then the sales you reap! Getting other people to voluntarily drive in TARGETED traffic for you – this can prove to be a powerful marketing weapon if handled with care… and executed correctly! How to “legally” steal other people’s traffic (and they won’t mind it)! How to get traffic into your websites without much or no effort continuously from the 10th day onwards! But that’s not the only help you’ll get with traffic generation, either. One of the easiest ways to drive more traffic to your blog is to use social bookmarking. Social Bookmarking sites are all the rage right now, and with good reason, too! They WORK! The problem, though, is that it’s time consuming to add each blog post to every social bookmarking site out there. I’ve seen people spend 5+ hours on this one task alone, and it’s only one of a handful of things you must do each day to drive maximum traffic to your blog. To save time with my social bookmarking, I use a tool called “Bookmarking Demon”. This is a desktop application that allows you to submit to an unlimited number of bookmarking sites at one time. Two (2) BONUS Videos On Using Bookmarking Demon … Bookmarking Demon is a tool that you can’t live without if you’re a blogger! It saves you HOURS of time every single day (nope, I’m not exaggerating there either — EVERY day!). One of my apprentices took the time to put together 2 fantastic videos that walk you through every step of using Bookmarking Demon to drive HUNDREDS of visitors to your blog every day. Watch these short videos and you’ll be blogging like a pro in no time! As you can see, we’re not leaving anything to chance here. If you can’t get results with you blog after using all these great resources, in many different multi-media formats to maximize your learning style, it just can’t be done! The “21 Days to Blogging Profits” Guide — this 64+ page, step-by-step guide to successful, profitable blogging is your textbook to blogging success. Just follow along from the beginning to the end, one step at a time, as it takes you from basic topics like researching your blog through advanced traffic generation strategies.By the time you’re done,you’ll be getting hundreds (and maybe even thousands) of visitors to your blog consistently,allowing you to both build your list and make sales of your own or affiliate products. Either way, the result is money in the bank! 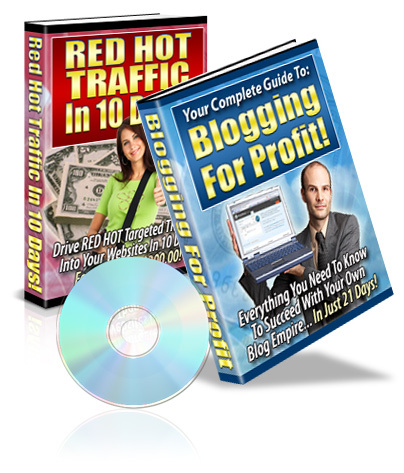 “Red Hot Traffic in 10 Days” – this step-by-step traffic generation plan will have you bringing in record breaking traffic in only 10 days! Just follow along and implement every single strategy using the simple instructions. 1 1/2 hour Teleconference Recording — Blogging with WordPress is the only way to go when you’re setting up your blog! This recording will turn you into a WordPress Pro in one sitting. Two (2) Flowcharts – Blog System Flowchart and the Blog Layout Flowchart give you an overview of the blogging process in a visual, easy to follow format. 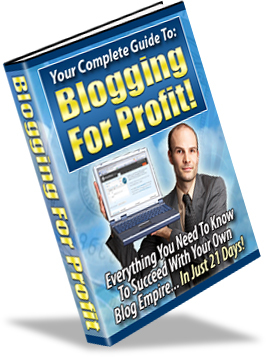 This is your Blueprint to Blogging Profits. Just follow along, step-by-step, to success from your blog! 4 Easy-to-Use, Blogging Checklists including “Installing/Upgrading WordPress”, “Titles/Tags/Meta Tags/Categories”, “Installing WordPress On Your Host”, “Setting Up Your WordPress Blog” & a ping list.These checklists are so comprehensive,they’re practically “mini reports”!Using the 4 Blogging Checklist will put you on the fast track to blogging success, and have you bringing in subscribers and sales from your blog visitors in no time! These are the same exact same checklists that I personally use with my former clients and my current apprentices, interns and coaching students. Two (2) BONUS Videos on Bookmarking Demon – these videos will help to save you hours each day in your social bookmarking and they’ll help ensure that you get great results from your efforts!. With everything that’s included in this package, I could easily have charged $147 or more and gotten it because this strategy WORKS. Without the “21 Days to Blogging Profits” Package, even if you could get your blog set up on your own (which would probably take you 3 to 5 times longer to do! ), it’s quite likely that you’d never get more than 5 to 10 visitors to your blog in a single day. When I shared the “21 Days to Blogging Profits” strategy with Henry Gold, he was able to use it to get over 5,000 unique visitors to his blog in less than 90 days! Many of my students are getting 100 to 500 visitors per day to their blogs in the first 30 days they’re blog is up. One student built a list of 318+ subscribers using his blog in well under 30 days. The following month, that list brought him more than $4,612 in affiliate commissions! That means he had to make well over $9,224 in sales! And he was a complete newbie to the internet only a few months earlier! That’s why I know that the “21 Days to Blogging Profits” strategy works and works REALLY well! The “21 Days to Blogging Profits” strategy can mean literally thousands of dollars a month in your pocket. That’s what many successful bloggers are making as you read these very words. Most assuredly, the “21 Days to Blogging Profits” strategy will mean that hundreds (probably even thousands) of hungry visitors in your market will visit your blog in the coming days and weeks where they will subscribe to YOUR list and buy those products you recommend. They’ll feel as though you’re their best friend. They’ll feel as though you’ve solved their biggest problems. And they’ll not only respect you for it, they’ll turn to you the next time they have a problem too! In other words, following this step-by-step strategy will allow you to build a relationship with your audience. One that will continue to grow over time, bringing in more profits for your pocket! That’s right, you can be well on your way to starting your very own successful income generating blog just a few minutes from now for just $47 $37! Get started right now by clicking the link below! You’ll be able to download “21 Days to Blogging Profits” even if it’s 3 am so you won’t have to wait another minute to get your blog up, running, and generating all those hungry visitors to your website! If you love blogging, are interested in starting a blog or need an easy way to make some money from home without spending more than a few hours a week on your online business venture the “21 Days to Blogging Profits” Package is for you! P.S. : The sooner you get your hands on the “21 Days to Blogging Profits” Package the sooner you can be well on your way to joining the thousands of regular people just like you who are making full time monthly incomes just by writing about things they are interested in their blogs! So why not give “21 Days to Blogging Profits” Package a 100% risk free try right now? P.P.S. : This package is available in downloadable format using files in .PDF, .mp3, and .ZIP format. In other words, you can download it instantly as soon as you make your payment in the order link above. There is absolutely no need to wait for weeks to have a physical copy shipped to your doorstep!